Federal prosecutors go to court in North Carolina on Monday in an attempt to obtain government ownership of an estimated $7 million in “Liberty Dollars” and silver bullion seized as contraband at a private mint in Coeur d’Alene. The forfeiture action comes 17 days after a jury in U.S. District Court in Statesville, N.C., convicted Bernard von NotHaus of conspiring against the U.S. government and manufacturing and selling counterfeit coins. The case against the 67-year-old is believed to be the first time the Justice Department has brought a successful criminal prosecution against someone minting, selling and circulating coins in direct competition with the U.S. Mint and Federal Reserve. The U.S. attorney who brought the case claims von NotHaus’ activities amounted to a form of domestic terrorism. But his defense attorney called that poppycock and blasted the Obama administration for bringing the case. Attorney Aaron Michel said von NotHaus did nothing illegal and promised to appeal the jury’s guilty verdicts and oppose the asset forfeiture. The owners of Sunshine Minting Co. and the private mint in Coeur d’Alene were not charged criminally, nor are they part of the forfeiture action. The coins and silver, gold, platinum and copper that will be the focus of the forfeiture hearing are owned by von NotHaus and an estimated 250,000 purchasers throughout the United States who left their Liberty coins at Sunshine Minting for safekeeping, not realizing they would be seized as contraband, said Michel, of Charlotte, N.C. The jury conviction of von NotHaus comes six years after the start of a joint investigation by the FBI and U.S. Secret Service into his nationwide Liberty Dollar operation. During that time, von NotHaus went from promoting private coinage to promoting marijuana as a religious drug. He started the “Free Marijuana Church” in Honolulu, giving away joints and calling himself a “high priest” who had used pot for 40 years. 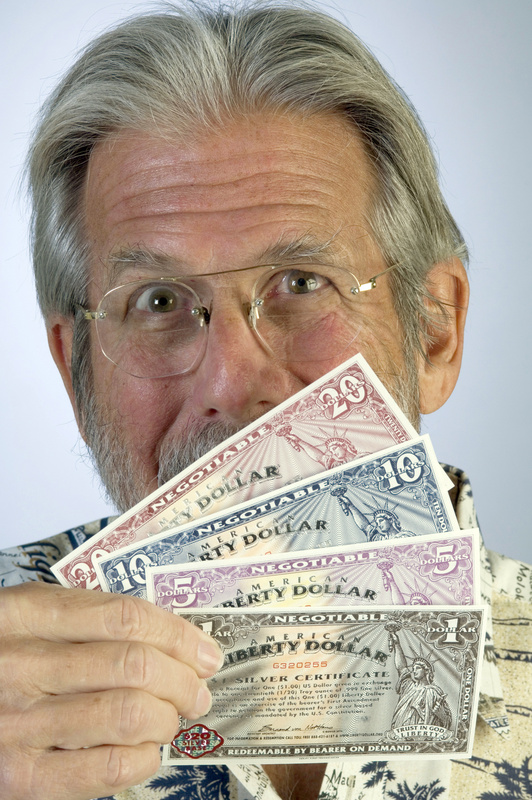 In 1998, while living in Hawaii, von NotHaus founded NORFED (the National Organization for the Repeal of the Federal Reserve Act and Internal Revenue Code) and began printing his own currency and minting coins. Quickly, von NotHaus and NORFED became icons in anti-tax and radical sovereign citizen movements throughout the United States. Using the Internet and media outlets targeting anti-government ranks, von NotHaus and his sales team also sold Liberty Dollars at redemption centers in nearly every state. In 2004, von NotHaus sold his coins and anti-Federal Reserve philosophy at the anti-government We the People organization’s first convention. The following year, the FBI and Secret Service opened an investigation of von NotHaus and his operation. In 2006, the U.S. Mint issued a statement warning that the NORFED operation was violating federal law. The Liberty Dollars – in $1, $5, $10, $20 and $50 denominations – were manufactured under a contract von NotHaus had with Sunshine Minting. His NORFED paper currency, printed elsewhere, was issued with the promise that it was backed by silver bullion in a vault at the Coeur d’Alene mint. In 2007, FBI agents served federal search warrants at the private mint, located at 750 W. Canfield Ave. in north Coeur d’Alene, and at NORFED’s headquarters in Evansville, Ind., where von NotHaus had moved. At the Coeur d’Alene mint, federal agents hauled away an estimated 7 tons of Liberty Dollar coins, silver bullion and coinage scraps, along with dies, molds and cast used in the minting operation. The seizure included 2 tons of freshly minted “Ron Paul” dollars, supporting the candidacy of the Republican congressman from Texas who unsuccessfully sought the 2008 GOP nomination for president. Search warrants also were served at two Coeur d’Alene accounting firms involved in what a jury has now determined to be a counterfeiting operation. The criminal indictment brought against von NotHaus only involved coins he manufactured, not the companion paper currency. Included on the forfeiture list are 8 tons of precious metals, including 168,599 silver Liberty Dollars in various denominations, an additional 1,000 pounds of silver bullion and 3,039 pounds of copper coins. Initially, the value of silver in the Liberty Dollars was less than their face value, and von NotHaus eagerly took Federal Reserve notes for their purchase. Over the past years, the value of silver has risen from $20 to about $35 an ounce, so the government-seized contraband now has a higher value. With the Liberty Dollars now viewed as contraband by the federal government, their numismatic value to some coin collectors is reportedly skyrocketing. No one is certain how many Liberty Dollars remain in circulation or in the hands of collectors, but it’s believed to be more than the $20 million estimate from a decade ago. The defense attorney said the case was a political prosecution and promised to vigorously oppose the government’s forfeiture attempt contained in the criminal indictment brought against von NotHaus. U.S. District Court Judge Richard Voorhees – not a jury – will decide if the assets should be forfeited. Michel said the coins and bullion seized in Coeur d’Alene not only belong to his client but to an estimated 250,000 purchasers throughout the United States. The defense also contends that 16,000 ounces of silver seized at Sunshine Minting belonged to Mary S. Nothhouse, the defendant’s mother, and shouldn’t be subjected to forfeiture. To bolster that claim, the defense has introduced a legal declaration from Tom Power, the current owner of Sunshine Minting. Sunshine Minting and Power were not criminally charged in the case, but Power was subpoenaed to testify at von NotHaus’ trial in Statesville, N.C. Power, who was not called as a witness for either side, did not return calls for comment. Power became owner of Sunshine Minting in 2007, eight years after the private mint began manufacturing the Liberty Dollars. On March 18, after an eight-day trial, a 12-member federal jury in Statesville deliberated only 90 minutes before convicting von NotHaus of making coins “resembling and similar to U.S. coins” and issuing, passing, selling and possessing Liberty Dollars intended for use and common currency. A sentencing date hasn’t been set, but von NotHaus faces up to 15 years in prison and a $250,000 fine. He remains free on bond, temporarily living in North Carolina. Through his attorney, he declined an interview request.